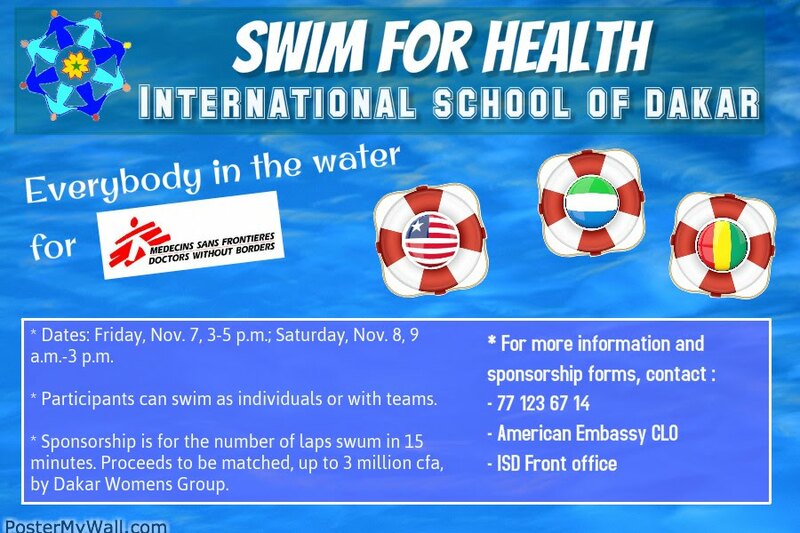 Dakar Women's Group and the International School of Dakar are co-sponsoring a swim competition to raise money for Medecins Sans Frontieres/Doctors Without Borders in their work fighting the spread of Ebola in West Africa. Teams of up to six people can be families, colleagues, sports clubs, embassies, NGOs, or you can swim as an individual. Swim times will be Friday, Nov. 7, from 3 p.m.-5 p.m., and Saturday, Nov. 8, from 9 a.m.-3 p.m. The money raised through sponsorship, up to 3 million cfa, will be matched by Dakar Women's Group. For more information, call Deirdre Bester, 77 123 6714. For registration forms, call Deirdre, or at ISD, see John Andrews.